Artisan jewellery maker Gill Connolly of Rohanna Jewellery recently commissioned me to make her some of my 'harlequin' beads in three very different colourways for her, and I was happy to oblige! I was thrilled to see them appear in some beautiful jewellery creations very soon afterwards, and Gill has kindly given me permission to use her image here. I'm beaming from ear to ear looking at her work - when beads leave the Let Fire Inspire workshop they are just beads - which is why it really makes me smile to see them given wearable life in stunning pieces such as these! You can find Rohanna Jewellery on Etsy, Instagram and Facebook, as well as at artisan fairs and Surrey boutiques. I was delighted to meet Kate during the first weekend of Artwave Festival, when she came to choose some beads to use in her jewellery projects. I was even more thrilled to see her during the second weekend, when she came to show me the beautiful pieces she had made with them. I was so touched, and Kate kindly allowed me to photograph her work for 'Beads in the Wild'! I neglected to snap a picture of another pair of earrings she'd made, which she was wearing - they were stunning. Kate sells her work at jewellery parties, and I'm looking forward to the chance to attend the next one! Sarah Skilton of Adventure Accessories showed me this fabulous picture of one of my lampwork glass bead pendants which she's using as a bag charm! I absolutely love it! 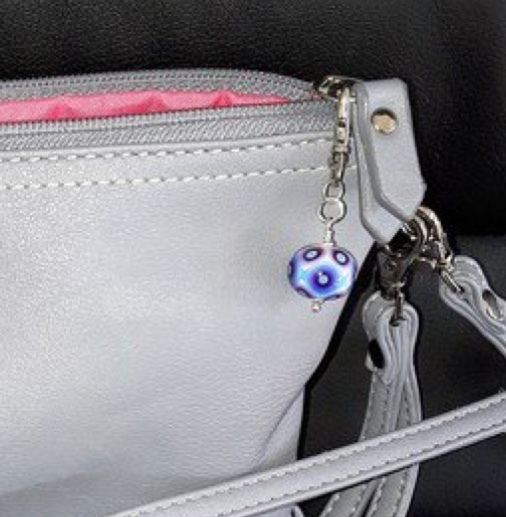 Whereas I often wear different necklaces, bracelets or earrings day-to-day, my bag is something that's with me pretty much all day every day - which is why I love the idea of a beady bag charm that's always there! Adventure Accessories combines Sarah's passion for the outdoors with her love of crafts, and she creates unique handcrafted gifts for outdoor enthusiasts. Do check out her website - you'll find all sorts of beautiful handmade goodies for adventuring both out in the wild and closer to home!